Technology has ushered in a new era for teaching and learning in classrooms from kindergarten through high school, with digital learning tools now an integral part of the K-12 environment. 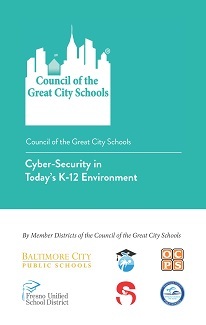 This white paper outlines key considerations for establishing secure environments, particularly for the large urban school districts that are part of the Council of the Great City Schools. The latest estimate from the Centers for Disease Control indicate that in 2012 there were over half a million (512,000) young women and girls at risk of undergoing female genital mutilation or cutting (FGM/C), the partial or total removal of a girl's external genitalia. The Council of the Great City Schools has partnered with Global Woman P.E.A.C.E. 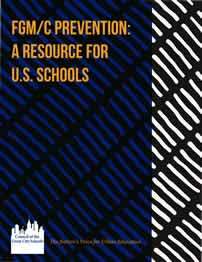 Foundation to create this resource guide for U.S. school staff to support the prevention of this dangerous non-medical surgical procedure. The challenge for members of the Council of the Great City Schools is to identify best practices in managing risk, referred to in this paper as Enterprise Risk Management or ERM. The purpose of this white paper is to present key concepts of ERM and enhance the understanding of how to apply ERM to a K-12 public school setting. This call-to-action publication results from a National Forum on Closing the Opportunity Gap for Early Readers, led by the Urban Libraries Council in partnership with the Council of the Great City Schools. The national forum focused on identifying areas of opportunity, gaps in knowledge, and strategic library-school school-community partnerships that lead to increased access to public library learning opportunities for low-income, at-risk, K-3rd grade students. This Souvenir Journal commemorates the 60th anniversary of the Council of the Great City Schools, chronicling the growth of the Council through its 60-year history. For the last several years, the U.S. Department of Education Office for Civil Rights (“OCR”) has been aggressively enforcing federal civil rights laws in school districts across the country. After providing a brief background on OCR and the laws it enforces, this article describes OCR’s efforts to enforce such laws through guidance, enforcement, and transparency. It concludes with a brief discussion of what school districts can expect when OCR initiates an investigation.